Gmail Labs has released a great new Search Autocomplete feature today that offers search suggestions for all kinds of Gmail searches, from simple search-by-contacts to more advanced search queries—like for specific attachments. 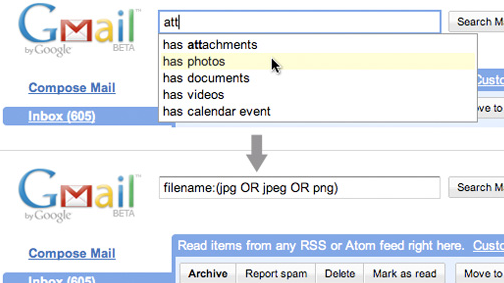 The autocomplete is very smart, too, so when you want to search for a specific attachment type—like photos—you can just choose the has photos autocomplete, and Gmail will generate the much more complicated filename:(jpg OR jpeg OR png) search operators. Handy, huh? Likewise, it’ll autogenerate the before and after date operators for you (before:yyyy/mm/dd), which have always been too complicated to remember all that well. As always, to enable this feature, just point your browser to Gmail Labs, enable Search Autocomplete, save your changes, and enjoy.